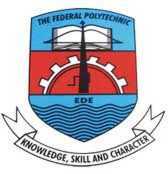 The Federal Polytechnic Ede HND Admission List of Candidates who have been offered provisional admission into the institution for the 2018/2019 academic session is out. We are using this medium to inform all the applicants who applied for admission into the Higher National Diploma (HND) programme of Federal Polytechnic Ede for the 2018/2019 academic session that the management has released the names of admitted candidates. Click on “Check Status” to view your admission details.